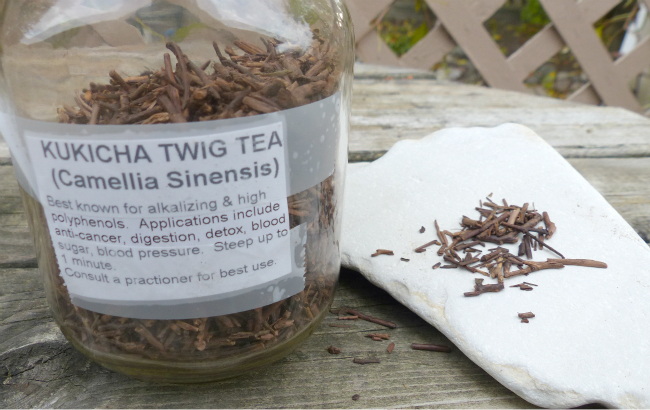 Also known as twig tea, kukicha tea is a Japanese tea in which the stems and stalks of the tea shrub are used. Twigs are pruned from the shrub, steamed, dried, aged, and then roasted to create an incredibly healthy tea. This tea (Camellia sinensis) contains vitamins A, B1, B2, B3, and C. It is also an incredible source of copper, calcium, selenium, manganese, fluoride, and zinc as well as catechins (polyphenols), flavonoids and amino acids. The polyphenols in this tea are the same polyphenols that are known to help fight cancer that is in green tea. Catechins act as powerful antioxidants, minimizing the effect of free radicals. One catechin in particular, epigallocatechin gallate (EGCG), has 25 to 100 times the antioxidant capability of vitamins C and E, which are the primary water-soluble and fat-soluble antioxidants. Interestingly, research has shown that EGCG may not only prevent some cancers, but it can also suppress some tumour growth. Aids in production of bile, which enhances digestive processes in the body. Reduces the risk of certain types of cancer. Fluoride helps to reduce plaque and bacterial infection. Can help to burn fat. Helps to maintain healthy kidneys and liver. Contains natural ingredients that are proven to have detoxification activities and antioxidant properties. Kukicha tea benefits are numerous and it is a nice tasting tea. Its primary impact lies in its ability to alkalize; kukicha tea helps to alkalize the body thereby balancing pH levels while helping to prevent disease. Free radicals can damage cell membranes and tissues and polyphenols (catechins) can help to reduce the effect of free radicals before they can harm the skin. Kukicha tea is rich in antioxidants which protect cell tissues from the damaging effects of oxygen thus aiding in achieving healthy skin. Helps in the skin’s healing process. Helps protect against several skin conditions including acne and psoriasis. Nutrients enrich and replenish damaged skin. With so many incredible health benefits you can add small quantities of this tea into your child’s favourite juice so that they too can benefit from kukicha tea. This tea is unique in that it contains very little caffeine. Kukicha is one of the preferred teas of the macrobiotic diet. Loaded with nutrients and health benefits, this is one tea that should become a part of your daily diet.